To reserve your spot in the HDX Class of 2023, complete your Housing Application & Enrollment Agreement and submit a $350 nonrefundable deposit at hendrix.edu/enroll by May 1. A liberal arts education isn’t easy. You don’t just “learn a little about a lot.” You read, think, write, argue, change your mind, and shape your unique view of the world. You constantly discover. It happens in lectures and labs, in recital halls and residence halls. It happens on the playing field and in field research. It doesn’t stop. That’s Hendrix. Here, you don’t just take notes and take tests. You learn to take chances and to make the whole world your classroom. The Hendrix Odyssey program ensures every student has more opportunity and more support for hands-on learning experiences than at any other institution. We strongly encourage study abroad, service projects, internships, undergraduate research and more. That’s engaged learning at Hendrix. You can’t hide from Hendrix faculty in small classes. But don’t worry. They’re here to help. They care. Not just whether you pass, fail or get the perfect grade. They want you to get the most out of Hendrix and be ready for life after college. That’s teaching at Hendrix … and that’s why Hendrix was named #8 for “Best Undergraduate Teaching" by U.S. News & World Report. We’re here to help you transition from a student to a leader on campus and beyond. Whether you want to be an artist or accountant, CEO or scientist, mathematician or minister, Hendrix offers 32 majors and 34 minors to put you on your path. Haven’t made up your mind? We help you prepare for graduate or professional school, the workforce and the world. That’s a liberal arts degree from Hendrix. Hendrix students can design their own degree — connecting courses and working independently with faculty from across campus. Interdisciplinary Studies majors help Hendrix students follow their own path built on a foundation of broad liberal arts education and faculty support. Our campus doesn’t close when class is dismissed. Hendrix students fill their days with everything from arts and athletics to special events and speakers. More than 70 student clubs and organizations represent everything from academics and activism to civics and service. That’s student life at Hendrix. It's your birthday? Woohoo! We’re ready to celebrate you with some unique Hendrix traditions. Hope you like cake, singing ... and swimming. More than 70 student clubs and organizations, from the Outdoor Club and Ultimate Frisbee team to groups for service and social activism, means student life doesn't end when class is dismissed. Hendrix student-athletes combine sportsmanship and scholarship. We offer 21 NCAA Division III intercollegiate sports and nationally recognized wellness and athletic facilities. Hendrix students get fit and have fun at the Wellness and Athletics Center (WAC), the home of our intramural sports program, climbing wall and fitness center, plus individual and group wellness programs. Hendrix students can integrate their faith with college life in lots of ways, from weekly chapel services and fellowship meals to Bible study and ministry exploration groups. We offer a welcoming and robust religious life program on campus. See how Hendrix students live, work and play together. And learn why living on campus is the heart of the Hendrix experience for students. 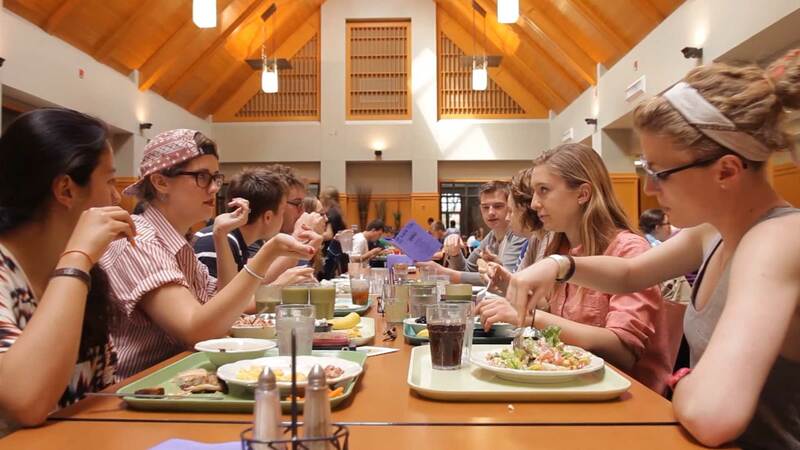 Residence halls are the home and hub of life on campus, hosting social events and serving the community. Welcome to a place that celebrates uniqueness. At Hendrix, you won’t find fraternities and sororities, reserved parking for the President or outsourced dining service. That’s not us. Like our students, we have a history of taking a different path. Here you find untraditional traditions like Shirttails and Campus Kitty. You find friendly people like our national award-winning dining services staff who know your name, ask you how your test went, and offer cake and a song on your birthday. They make Hendrix … Hendrix. Our campus is 175 acres of gorgeous … with academic buildings for the arts, humanities and sciences, historic residence halls and student apartments, and a new Student Life and Technology Center and Wellness and Athletics Center. Between the red brick buildings, the fountain and flower beds, you’ll find challenge and support, work and play, pecan shells and squirrels. Lots of squirrels. They make Hendrix … Hendrix. Is Hendrix right for you? Schedule your visit today and see for yourself. Meet our students and see why they chose Hendrix. Get to know our faculty and hear how they challenge students to be their best. Why would a student come to Conway, Arkansas? Because friendly folks are easy to find and happy to help — whether it’s finding internship and employment opportunities, exploring the capital city 30 minutes away or enjoying outdoor adventures in the Buffalo National River and Ozark and Ouachita Mountains. Our alumni are proof that you can do anything with a liberal arts degree from Hendrix. Community leaders, CEOs, stage and screen actors, elected officials, physicians, Pulitzer Prize winners and Pentagon advisors are just a few of our alumni success stories. Aerospace Engineer. With a reach that stretches as far as Pluto. Currently the production manager for the Laboratory for Atmospheric and Space Physics (LASP), Chelsey Bryant Krug began her post-graduate project at LASP in 2002. The payoff came in 2015, when the New Horizons spacecraft carrying her work completed its journey to Pluto. And that isn’t all; her portfolio includes projects that have launched to study Earth's atmosphere, the moon, the sun, and Mars. In pursuing a Ph.D. in Comparative Biology at the American Museum of Natural History, Anna Ragni gets to focus on her passions: human origins and primate evolution. By studying elements of the fossil record, she’s learning more about the evolution of locomotion among primates–including why humans move the way we do today. Watson Fellow. Entrepreneur for education. For his Hendrix Odyssey, he explored ways to improve third-graders’ test scores in Forrest City. As a Watson Fellow, he visited three continents to study educational philosophy. Now, Nathan Thomas lives his passion for learning by developing the Clinton Foundation’s K-12 educational programs. And when he’s not doing world-changing work for that global nonprofit, he’s volunteering with TEDxMarkhamSt, the Arkansas Association for Black Professionals, and Create Little Rock. There’s new ground to be broken in the way classic operas are staged, and Daniel Ellis is part of the excavation crew. Ever seen The Magic Flute with the visual flair of 1920s silent film? Add projection of hand-drawn animation, including 800 video cues that the opera singers interact with, and you have a production he has directed in the U.S. and Europe. Hendrix is one of the best liberal arts colleges in the country (#4“Most Innovative National Liberal Arts Colleges” — U.S. News & World Report). With the financial aid we offer, we’re also one of the most affordable. 100% of enrolling students receive financial assistance, and our average financial aid package is well over $100,000 over four years. Enter the Hendrix code, 001099, on the FAFSA to apply at Hendrix. Don’t assume that your family does not qualify for need-based assistance and skip this important step. The only way to make sure that you are eligible to be considered for need-based assistance at Hendrix is to submit the FAFSA. Additional aid is available from federal and state grants, students loans, and work study. don’t put off applying to Hendrix. Using the Common Application is the easiest way to apply to Hendrix. Instructions and online help are available at the Common App website. Click here to start the Hendrix application. Is Hendrix right for you? Are you right for Hendrix? There's only one way to find out. Request more information. Give us your name and email, and let's start a conversation. Oops! Can I change my last answer?